Today's find from the Lady Heyes Centre. 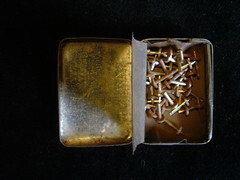 A wondeful box of Junior Service Clips made by a firm in Birmingham.It looks to me like the firm once made pen nibs as the label on the back says. 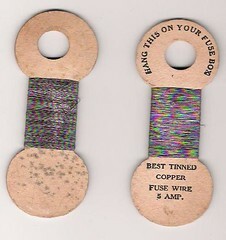 THIS LABEL IS ISSUED BY BRITISH PENS LTD.
and the clips are made using similar techniques to pen nib making. The label on the front says. 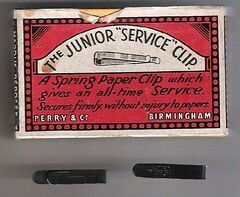 A spring paper Clip which gives an all-time Service. 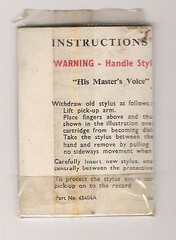 Secures firmly without injury to papers. Found on a trip to Crewe market this week. 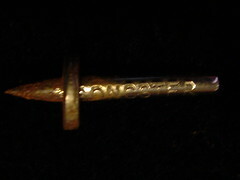 The needled are made of bronze. "MADE SPECIALLY FOR PICK-UP & CINEMA USE"
THERE ARE EIGHT DISTINCT TONES.EXTRA LOUD.LOUD.MEDIUM.SOFT.SPEARPOINT.GOLDEN.COLLAR.AND PICK-UP,TO SUIT ALL TASTES. 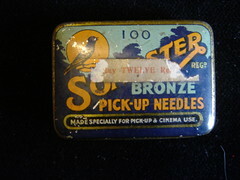 The tin still contains over 50 needles and the original black paper wrapper. These are the first pick-up needles I have seen which are this shape. The needles are only about 11mm long. Each one has "SONGSTER" stamped on it. 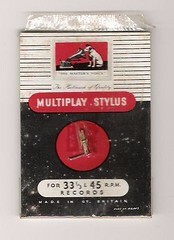 for 33 and a third or 45RPM Records. The instructions are sealed inside and can only be partly read. pick-up on to the record. Perhaps I should have opened the packet! Cardboard shapes with very useful fuse wire on it. The Writing around the top instructs you to..
"HANG THIS ON YOUR FUSE BOX"